Beautiful Genuine sea glass jewelry, Beach Glass jewelry and Island jewelry! ~Jersey Shore Greetings & ~HAPPY EASTER!~ From AMERICAN CRAFT WORKS.com! Home of Gorgeous "Genuine"~Sea Glass jewelry~~Beach Glass jewelry~ Island jewelry & much, much more to come!! Welcome to AmericanCraftWorks.Com, your friendly online Genuine Beach Glass Jewelry, seaglass Jewelry and Island Jewelry Store! We want you to enjoy the time you spend here---each and every time you visit! We offer an array of Beautiful Genuine seaglass Jewelry and beachglass jewelry along with Tropical Island jewelry with Awesome Swarovski Crystals and Czech Glass Beads on an assortment of chains & settings including Sterling Silver and 14K Gold Filled all at Incredible Wholesale Prices! We pride ourselves on both our very Personable Service as well as the Lovely products we carry! If you love the Beach and Genuine Sea Glass jewelry then you're just a click away from Beautiful Jewelry at Amazing Prices! Guaranteed! Enjoy my Site! ......CHECK OUT MY BRAND NEW WEBSITE...... SEAGLASS DREAMS JUST CLICK HERE! We Gladly accept PayPal and we're Verified! To join just Click on the Seal! It's Fast and Easy! NEW and a GREAT PRICE!! Antique Gold Sand Dollar and Swarovski Blue Zircon Bicone Crystal Island Necklace! This Necklace is also available in Sterling Silver with 2 Gorgeous Austrian Aqua Blue Crystals! !Just Click the Pic! My Brand New "eBay Store" is now open for business! I'm stocking my shelves with my Sea Glass jewelry at an even Greater savings to you! Please CLICK HERE to have a look! Just $24.00!!! Compare elsewhere for $60.00 or much more!! The earrings in the above pics were Sold but yours will be Similar in Style, but Genuine Seaglass is Unique and each Pair will Differ in Shape but Guaranteed to be just as Beautiful!! We offer the best prices for "Genuine" Sea Glass jewelry on the internet! Choose from Beautiful Pendants-Bracelets & Anklets & Lovely Necklaces, Earrings & Pins! All made from "Genuine" Sea Glass & Beach Glass from the Jersey Shore & Carribbean Islands!! We are continually adding new & exciting jewelry designs so keep coming back! And don't miss out on our "Island Jewelry" which offers Bracelets,Earrings,Necklaces and more made from Czech crystals & beads in an array of Tropical themes & Caribbean colors! Join our Mailing List for a monthly newsletter on Sales, New Items & Special Marked down prices only available to subscribers!! ..Please Select a Category below..
NECKLACES1 BRACELETS NECKLACES2 EARRINGS PINS SETS SALE ITEMS! We here at American Craft Works would like to greet you personally! just click on About Us to start your tour. 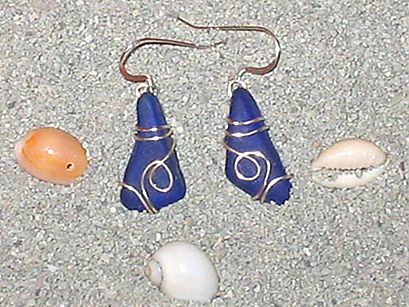 "Enter our monthly drawing for a beautifully hand crafted pair of "Island Earrings of your choice"! with "Monthly Give-Away Entry" in the subject line. We are a proud member of PayPal and we're "VERIFIED"! "The way to send and receive money online"! Join now, its fast and easy!